We are a leader in supplying of Aesbestos cement Roofing Sheets. These are available as per buyer requirements and at affordable prices to our buyers. 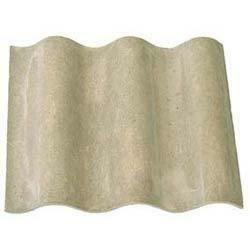 We provide Everest Cement corrugated roof sheets & accessories. Hi Tech is a unique product manufactured in India. It is a corrugated cement roofing sheet reinforced with a blend of strong factory produced fibres including HIPP (High impact Polypropylene). Everest corrugated sheets are made from the finest quality cement and fibre through a specially developed fibre orientation process. They undergo rigorous quality control – standards which are much higher than ISI – giving you a product of lasting value. They are low maintenance, easy to fix, fire resistant and economical. We are engaged in offering Everest Metal Roofing Sheet. Authorized Wholesale Dealer of a wide range of products which include Fiber Everest Roofing Sheet and Asbestos Cement Sheet.